Written in Irish Issues: 10/17/16, 16:01:44 by admin | Print article | View all categories. Report prepared by John Haughton Hon. 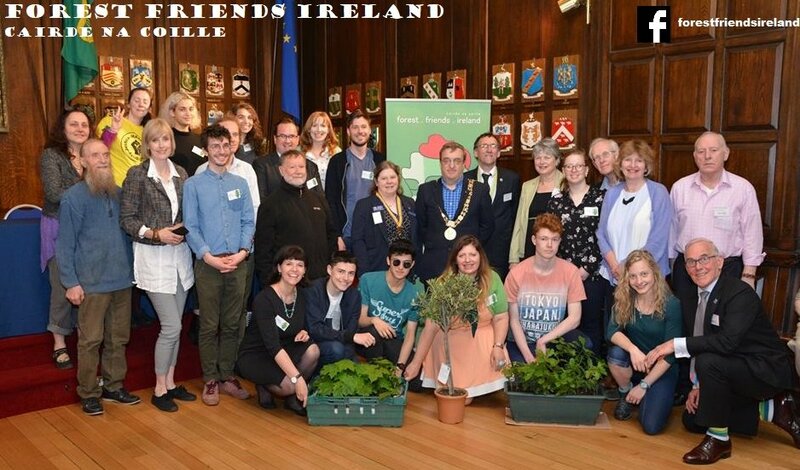 President, Forest Friends Ireland on behalf of Forest Friends Ireland/Cáirde na Coille. THE AARHUS CONVENTION: Ireland ratified the UNECE Convention on Access to Information, Public Participation in Decision-making and Access to Justice in Environmental Matters, commonly referred to as the Aarhus Convention, on 20th June 2012. It is essential that the councils set up structures required to implement this convention in their areas of responsibility. This would involve making comprehensive directories of all community associations environmental organisations, charities business and other organisations, and involving then as stakeholders in decision making processes, using principles of empowerment, constructive involvement, and subsidiary function. WATER: Taps in public places should activate when hands are placed under them. These would be part of the design of new build. Manually operated taps should be phased out with specific timescales of existing buildings. Carbon neutral buildings should be advocated and where public agencies are involved they should be the norm. Standards of insulation of new build should be raised to their maximum. LIGHTING: It should be the norm that lights become operational when one is entering a room and extinguish on exiting except where the interests of public safety suggest otherwise. SOLAR PANELS: All new buildings should have solar panels on the south or west racing side of the buildings. These should be part of the design. Grants should be available for these. RETROFITTING: Comprehensive surveys of all buildings free of charge should be available to all owners. Grants attractive to ensure a very high level of take-up should be available. Each local authority should take responsibility for its own area. An inspectorial and advisory facility should be part of this initiative. CYCLING: where possible footpaths should be redesigned so that cyclists can share their use. During rush hours morning and evening cycling should be legal on footpaths. Plans should be prepared for extensive contra flow cycle lanes where practicable. FOOD SOVEREIGNTY: effort should be made to support local food systems and to improve connections between producers and consumers. Local authorities should establish municipal agricultural cooperatives to encourage facilitate and support urban food production. These could provide agricultural extension services, assist with access to land and materials and purchase at a guaranteed price to sell directly to consumers. The development of allotments should be further promoted in suitable locations. Grants should be made available for community horticultural projects and projects at the individual household level which meet certain standards and scale. DIET: Vegetarian and Vegan diets can contribute significantly to carbon and methane reduction. Promote where possible or at least disseminate information on factual aspects of these diets. GARDENING COURSES: The local authorities should promote develop and subsidise programs for, offer support to existing community gardens and encourage and facilitate the formation of new ones. COOOPERATIVES: the establishment of cooperatives should be facilitated as part of an agreed program to achieve objectives outlined in the program. PROMOTING BIODIVERSITY: Grants should be made available to local community and environmental organisations for projects which contain trees and shrubs and other perennial plants which promote a high level of biodiversity. Plants which help the pollinators should be a priority. BEEKEEPING: Courses in beekeeping should be facilitated and subsidised to encourage residents to be informed as to their potential for them and avail of their usefulness. THE JOURNEY TO WORK: It should be an objective to change the modal split in favour of public transport using specific targets, e.g. 60% public transport, 40% private, with timescales to achieve the required levels. REDUCING TRAFFIC FLOWS GENERALLY: Various methods should be employed to reduce traffic flows, including teleworking, working from home, for example one day per week, even/odd car numbers having access to the city centre, job sharing, car pooling. VEHICULAR POWER SOURCE: sources of vehicular fuel should be actively promoted in specific schemes which support way of limiting the prevalence of the internal combustion engine. TELECONFERENCING: The technology is now available for teleconferencing. Funding should be made available for equipment to be installed to make this possible and reduce the need for physical presence at meetings. Applications could be assessed on a case by case basis. TREES: THE ROLE OF TREES: there should be specific targets to increase tree cover in each local authority area, for example increase from 7% to 20% to achieve what already exists in some European cities. A mature tree can store up to a ton of carbon. PROMOTING TREES SHRUBS FOR DOMESTIC USE: The local authorities should make trees of appropriate scale available for individual domestic use either at no cost or minimum cost to ensure a high level of take-up, e.g. apple or pear trees, currants, gooseberry, raspberry, guilder Rose, Rowan, Silver birch. JOB CREATION INNOVATION ENTREPRENEURSHIP There is an opportunity now for job creation and innovation in areas which may have been on the back burner for some time. The conceptual framework envisaged in this document is based for some categories on empowerment and constructive involvement of sectors of society which have been marginalised without the tools and skills to form SMES in their local communities where they are seen as workers rather than innovators. In terms of upskilling there has been limited successes and the best that has been done for senior citizens who have so much skill and experience is often a ‘men’s shed’. Surely they have so much more to offer to society. An innovative approach would appear to be possible in the area of horticulture and gardening/landscaping which appear to have taken a big hit in the recession. Here the industry and the communities could create innovative SMES developed on a cooperative basis. NEW STRUCTURES NEEDED: New structures would be needed with the different local authorities working together as a team rather than specialising in their traditional ‘separatednesses’. Crossover operations are called for. NEEDED FOR A MASTER PLAN AND SPECIFIC BUDGET: A Master plan should be made and a separate budget created for the implementation of the programs envisaged. The program should be monitored over time with annual reports on progress made. Partnerships should be created designed to achieve objectives, e.g. teleconferencing. There should be a shared promotional and facilitating agency sufficiently resourced to ensure the success of the initiatives identified. Where necessary bye-laws should be introduced in order to achieve objectives of the program.